A UK student has been told he had to resit his exams whilst still on holiday in Cape Verde. Jordan Manuél Thomas was on holiday in Cape Verde, when he found out he'd have to resit his exams. Then he found out that his University expected him to resit the exams whilst still in Cape Verde and would have to travel to a non-English-speaking university, and request they open so that he could sit his exam there. Jordan posted this status to Facebook about his ordeal. Jordan was supposed to have been able to sit the exam a few weeks before, but it had been rescheduled. He was then supposed to receive a follow-up email from Bournemouth confirming the new time and location of his resit, which was meant to happen before he went away. “The email never came" he told the Tab. "And it wasn’t till half nine on the Tuesday morning, when I had a phone call asking where I was, that I next heard anything." At that point, he was already in Cape Verde, off the north coast of Africa. 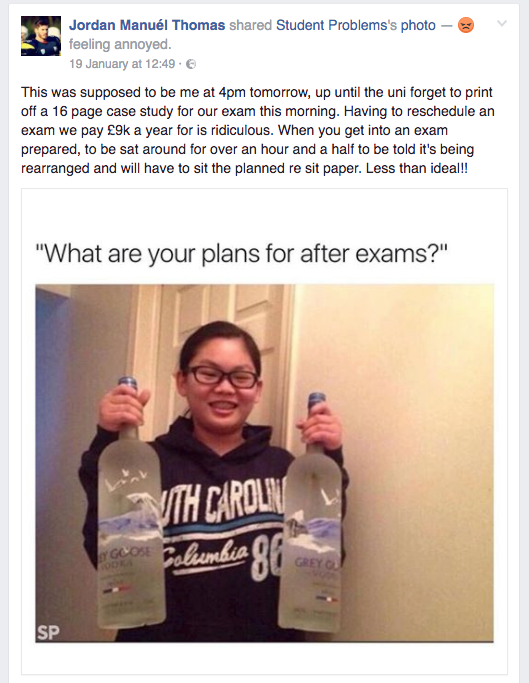 “I was then told that I had to sit the exam on February 1st and that I had to organise this myself." They sent an email to him informing him that he'd have to arrange to sit the exam on the first in Cape Verde. But they didn't seem to realise that Cape Verde is a collection of islands, and Jordan wasn't even on the same island as the University. A trip to the island in order to take his exam would have cost him €500. Jordan spoke to his SU president, who he described as extremely helpful, and in the end he wan't forced to track down a university whilst in Cape Verde. “We can confirm that we are doing all we can to ensure that all students are able to sit their exams, with all options explored."